Unified Theory Games will have their Vortex miniatures combat rules at GenCon and they're having quite a sale on it while there. To celebrate Gen Con, Unified Theory Games is offering the Vortex: Core Rulebook for a record half-price. Have you ever walked the Gen Con hall and found an amazing miniature that didn’t fit into any game? Well, go ahead and get it because it works in Vortex. 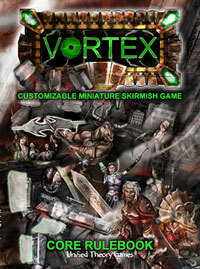 Vortex is a customizable miniature skirmish game that can be used with any miniature in any setting. The Vortex: Core Rulebook contains rules for building Combatants, over 270 Abilities, Liabilities, Weapon Features and Flaws, dozens of pre-constructed Combatants, an amazing array of Scenarios, and a complete easy-to-play Campaign System that allows your miniatures to gain experience and grow as characters. Get your copy today for this extremely low price and get gaming.